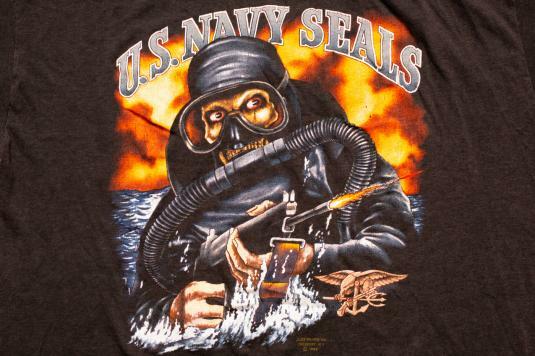 Rare, true vintage 1980s 3D Emblem U.S. Navy Seals frogman skeleton graphic t-shirt; made in USA. It is a see-thru, paper thin 50/50 blend tee! It is in very good vintage used condition with fading, some cracking on the graphics, and several darker spots on the front. Era: Vintage 80s – ©1989 Just Brass Inc.
Actual Size: Modern M? – Length 26" – Pit to pit 20"